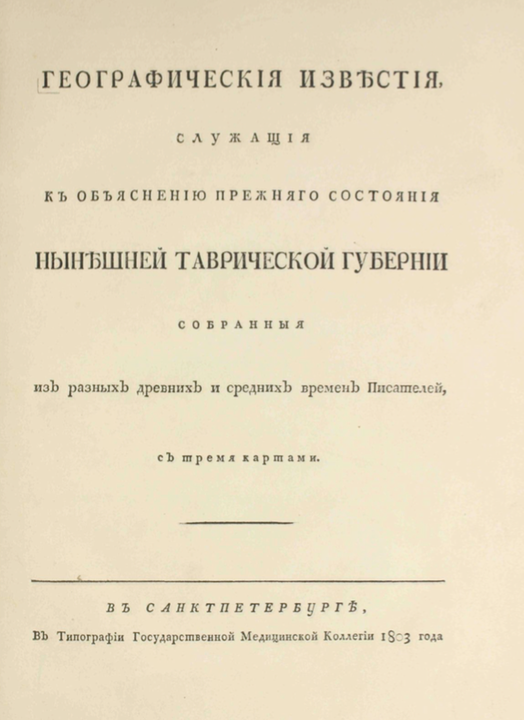 This volume is a geographical survey of the lower Tauric province, also called among other names “Tauris”, which is today known as the Crimean peninsula. Divided into four parts, it contains geographical descriptions of mountains and planes together with detailed accounts of ancient towns, settlements and trade in a historic perspective. 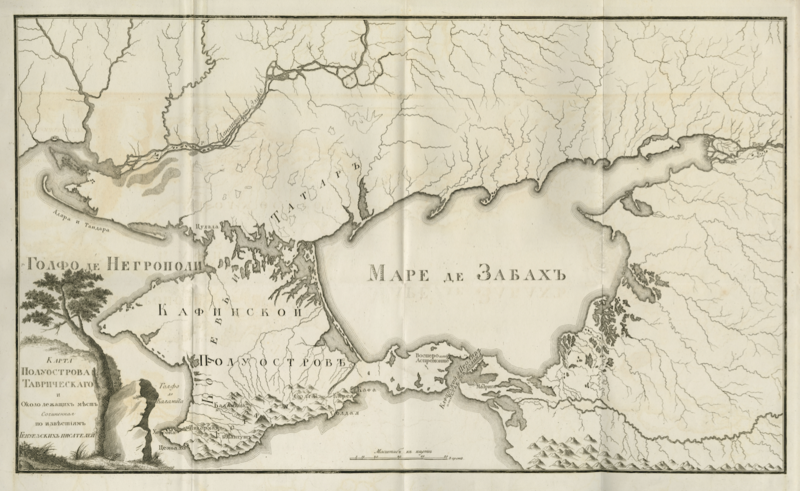 Attached to the last page, there are three maps of the Crimean peninsula. In the first part of the volume there is geographical information concerning the previous situation of the lower planes of Tauris. The author describes interesting places worth visiting between Dnieper and Perikop; Greek settlements along Dnieper, Olbya city, Kirkinkis city and the bay of Kirkinkis; the Ahilleos dromos peninsula; and a stonewall built by Alexander, the King of the Bosporus. In this section the author provides accounts of the old names for the Samara, Kalachakra and Molochna rivers; the Tarhan cape, previously known as Tamirake, and the city of Kozlow previously known as Geopatoria city. In the second part of the volume the author surveys the mountains of the region as well as urban areas. He accounts for interesting sights and monuments worth visiting in the town of Kherson, and its people and history. 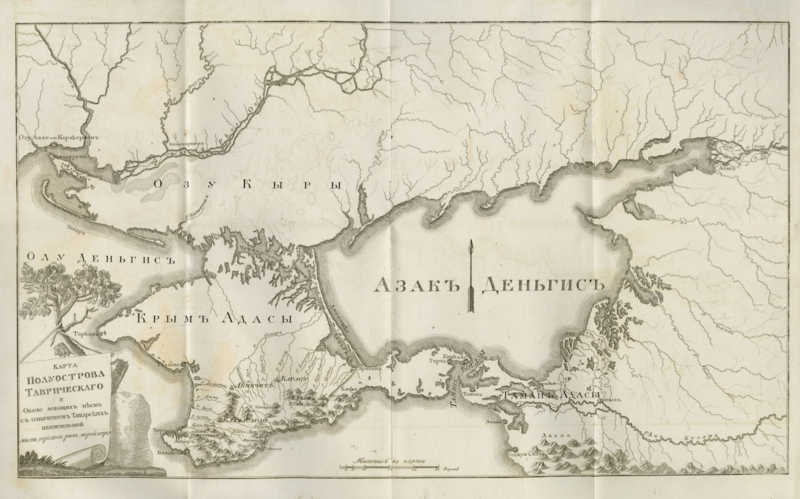 Furthermore, descriptions are given of Sevastopol bay, previously know as Ktenos; Georgian cape previously know as Parthenon cape; Balaklava city previously know as Simvolon; the city of Sudak, previously known as Sugdaya or Soldaya; and the fortresses of Kherson which is positioned along the sea shore. A detailed account is given of the ancient city of Theodosia and its destruction; the Kafas fortress built on the same place where Theodosia was founded; and the construction of Kafa city by the Genovese. Descriptions are also given of the towns Karas-Bazar, Akmecet and Bahcesaray; the Jewish fortress near Bahcesaray; three large old fortresses close to Bahcesaray called Polakiyon, Chavun and Neapolis, the remains of which are situated near Tepe-Kirman, Cherkez-Kirman, Eski-Kirman. The author additionally writes about the town of Eski-Krim considered to be old Cimerion once known by Homer. The third part of the volume is about the Kherch peninsula, different terms used for the Asian lake, one of its straits, the nearby towns, and trade through the strait. In this part the author focuses on the town of Zinonos Kherzonisos; a narrow stretch of the land called Arabash; different names for the Azov sea; different names for the Yenikale strait; fruitful soil on the Kerch peninsula; trade which took place in the straits; the Greek settlements Nympheon, Myrmekion, and Parthenion; and Yenikale Fortress. In the fourth and final part of the book, about Taman Island, the author comments on the different names used for Taman Island and the Kuban river, after which he draws the reader’s attention to Greek settlements on Taman Island and Taman oil sources which were well known in the 10th century. The author notes that Taman city is stated to be Mutarakan city by some writers. The towns of Temruk and Berzemen built by the Circassians are also mentioned. 1. 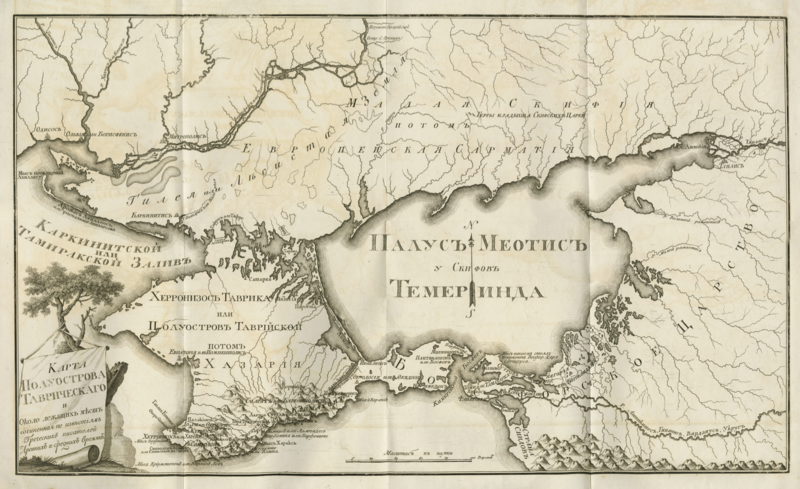 Map of the Tauric [Crimean] Peninsula according to ancient Greek sources. 2. Map of the Tauric [Crimean] Peninsula according to Genoese sources. 3. Map of the Tauric [Crimean] Peninsula and the surroundings, with Tatarian place names, names of rivers, seas, and others.